A 'ferociously fast' Exige Sport 380 has been unveiled by Lotus - described as the most aggressive Exige yet. With 380 PS, 0-62mph take just 3.7 seconds (0-60mph in 3.5 seconds), on to a top speed 178 mph. The new top-of-the-range model features 'significant revisions' over the Exige Sport 350 - lowering weight, boosting power and enhancing aerodynamics. With a dry weight of just 1,066 kg, lightweight options, and a power-to-weight ratio of 352 hp per tonne, the new Exige has been ‘conceived to out perform and out manoeuvre’ top-end supercars. From the exposed-gear-change linkage, to carbon-fibre components and Michelin Pilot Sport Cup 2 tyres as standard, the 380 is firmly defined as a Lotus for the enthusiast. Infused with carbon fibre from front to back, the Exige Sport 380 features hand-made, high-gloss visible weave components as standard to deliver a weight saving when compared to the Exige Sport 350. This includes the front splitter, revised front access panel, new rear wing and rear diffuser surround, which together save 2.7 kg. A lightweight, transparent polycarbonate rear window saves 0.9 kg over the glass equivalent in the Exige Sport 350. 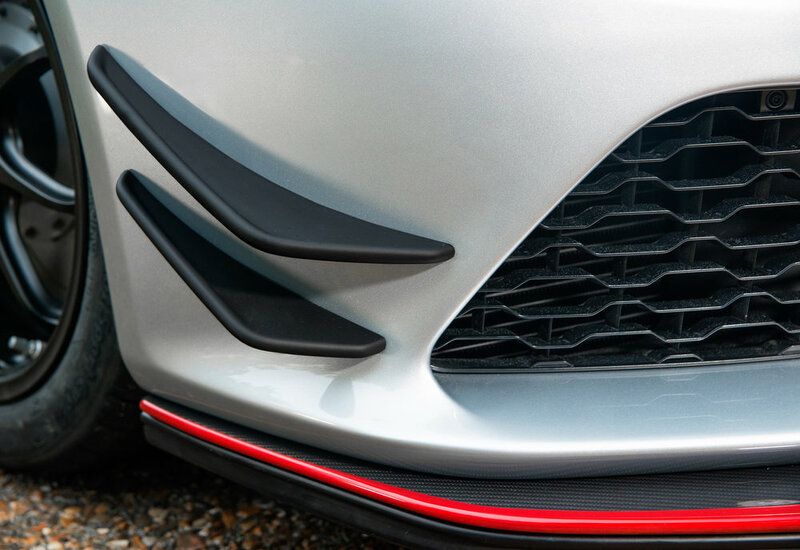 A carbon front spoiler and rubber lip spoiler combined with the carbon barge boards reduce pressure under the vehicle while a carbon rear wing and air blades behind the rear wheels, all work to help raise downforce to a 140 kg at maximum speed - a 60% gain over the Exige Sport 350, which generates 88 kg at its maximum speed. In addition, the carbon race seats (-6 kg), lithium- ion battery (-10.3 kg), ultra-lightweight forged wheels and grooved two-piece brake discs (-10 kg) combine to cut an extra 26.3 kg. A new design of rear transom panel now has two rear light clusters, rather than the four on the Exige Sport 350, with reversing and fog lights now mounted inboard, cutting weight by a further 0.3 kg. The uprated 3.5-litre supercharged V6 engine generates 375 hp at 6,700 rpm and 410 Nm (302 lbft) of torque at 5,000 rpm. 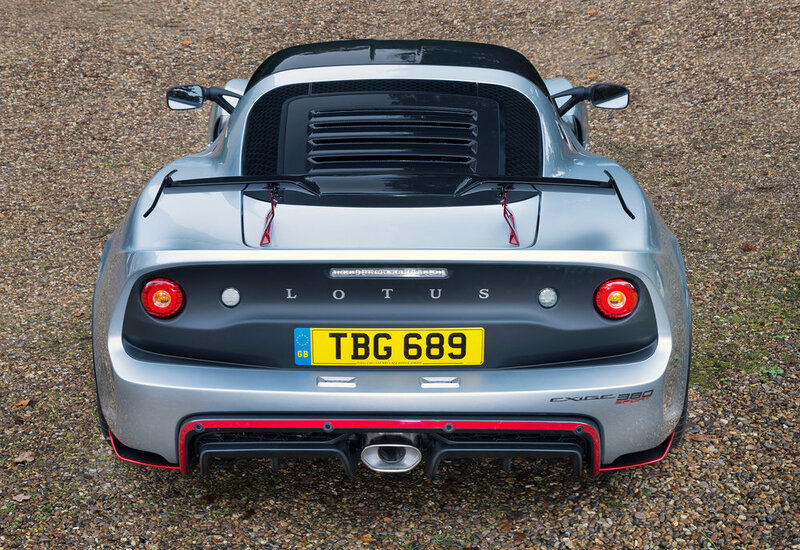 The increase in power comes from a revised supercharger pulley, which increases charge pressure, an uprated fuel pump, a recalibrated ECU and the introduction of a revised exhaust system – as used in the Evora 400 and Evora Sport 410. The Exige can be ordered with an optional six-speed automatic gearbox, where drivers can select gears sequentially via the forged aluminium paddles located behind the steering wheel, or rely on the gearbox’s fully automatic mode. A Dynamic Performance Management (DPM) provides enhanced ‘Sport’ and ‘Race’ settings. Proportionally increasing throttle response, lowering traction slip thresholds and removing understeer recognition, it provides the driver with a finer level of control before the system intervenes. DPM also utilises an engine exhaust bypass valve at mid-to-high engine speeds, further reducing back pressure to boost throttle response and engine performance in both ‘Sport’ and ‘Race’ settings. Hand finished detailing on the inside includes the carbon fibre sports seats trimmed with either Alcantara, leather or tartan, all featuring contrast stitching. 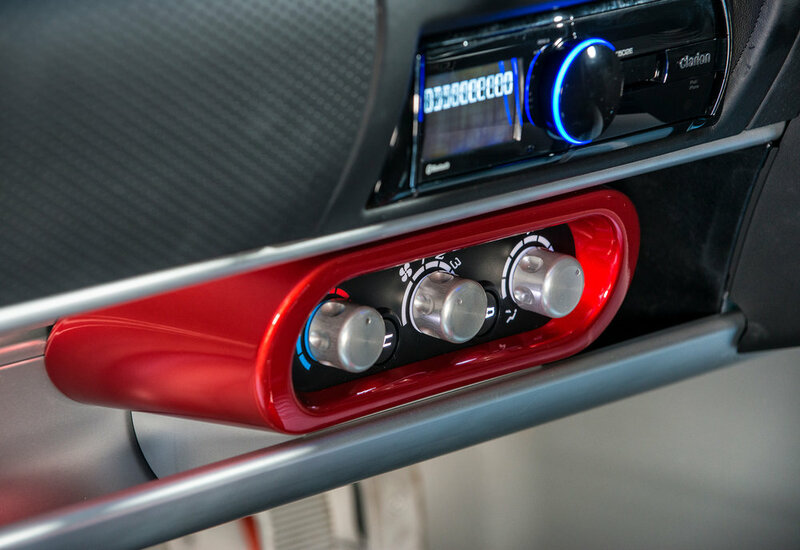 An Interior Colour Pack provides contrasting surrounds to the transmission console, HVAC surround, carbon seat eyelets and electric window bezels in one of four colours. A new integrated entertainment system can also be specified, including iPod connectivity and Bluetooth functionality, along with air conditioning. The Lotus Exige Sport 380 is available as a roadster as standard or as a Coupe as an option with prices starting at £67,900 OTR.